I am a big fan of Rich Roll. I'm not sure where or how I learned of him. his drive, and his desire to help others to become more "healthy" in there own lives. He began doing podcasts back in November 2012, and I have listened to every one of them. to see what new the podcast will be. 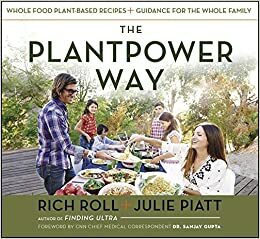 Rich and his wife, Julie Piatt have just released a new book called The Plantpower Way . Two years in the making, it just released last month. GET IT! It will change the way you think about your life. belief that anyone of us can be better...You will not find better guides in that quest"